Another lovely wee commissioned personal ‘Baby stool’ order by this Galgorm, Ballymena customer, who has ordered a number of my baby stool crafts over the years for christening gifts, and always with her lovely wee colourful soldier men! Just love it!! Do you LOVE TRACTORS! ……. I know I love these very cute wee painted tractor images, available in FOUR colours ‘Blue / Pink / Green / Red’ ! ADD ANY TEXT DETAILS to Personalize! Other images can be painted – any image you wish! Bears / Babies / Fairies / Football / Toy Soldiers / Bunnies / Angels /Animals / Rocking Horse / anything! Scooby Doo / Paw Patrol / Minions / Trolls / Powerpuff Girls / Peppa Pig …… and more! CONTACT me to place you personal order – Get in early for CHRISTMAS! My Xmas workload gets very busy! 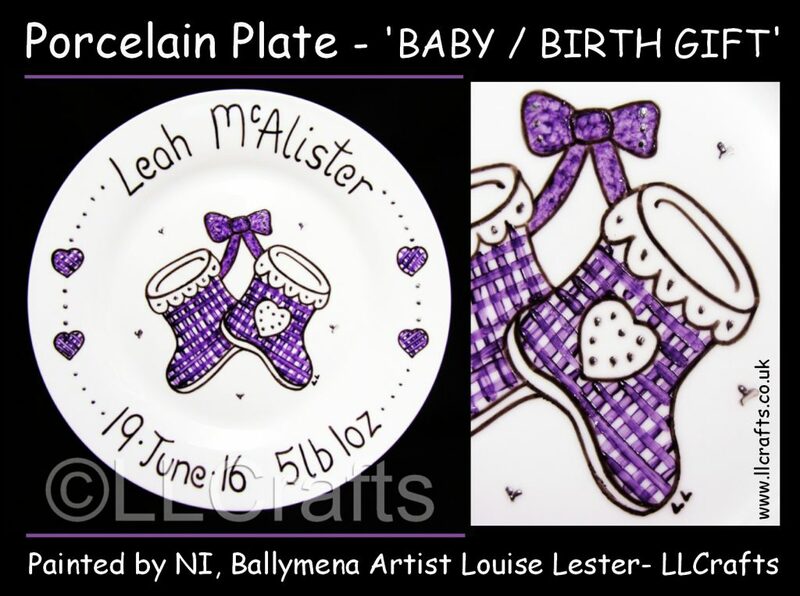 This beautiful wee ‘Purple Booties’ painted BABY PLATE was commissioned by a Ballymena, Northern Ireland customer …….. for a ‘new birth’ baby gift! The design of this plate is – (Design Choice 1- No Coloured Surround) ……. there are three design choices! 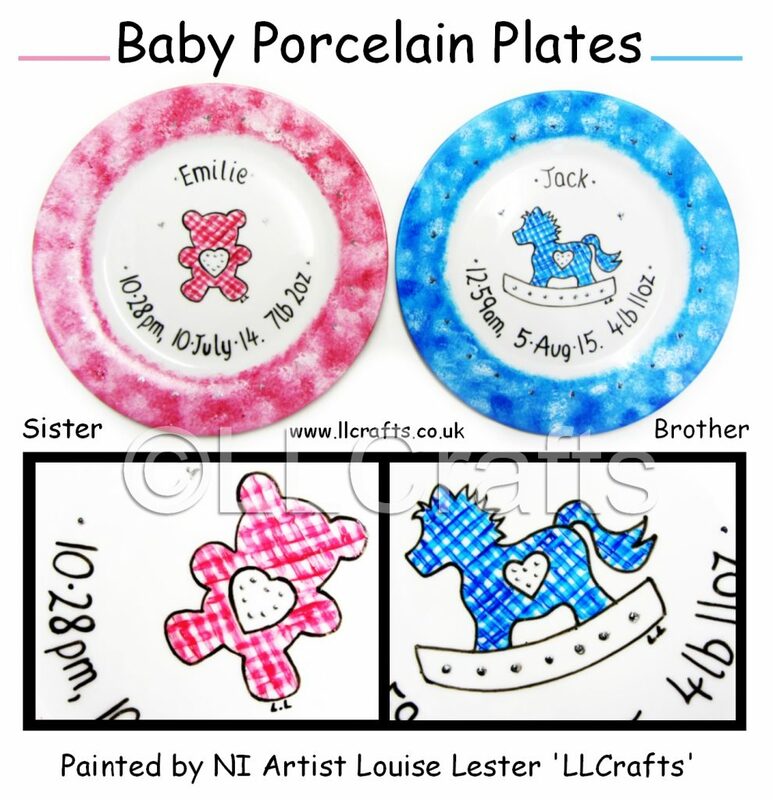 CONTACT me with any queries or orders …….. my handpainted Porcelain plates make the perfect unique, personalized CHRISTMAS GIFTS! 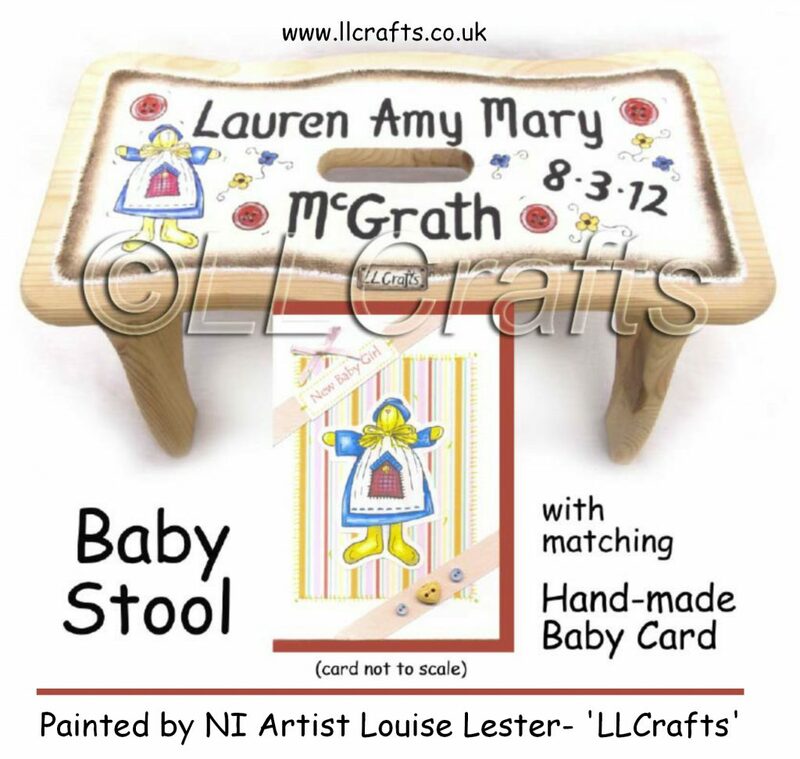 Just got another commissioned order for one of my lovely wee BABY STOOLS …… for a babies ‘First Christmas’ gift! 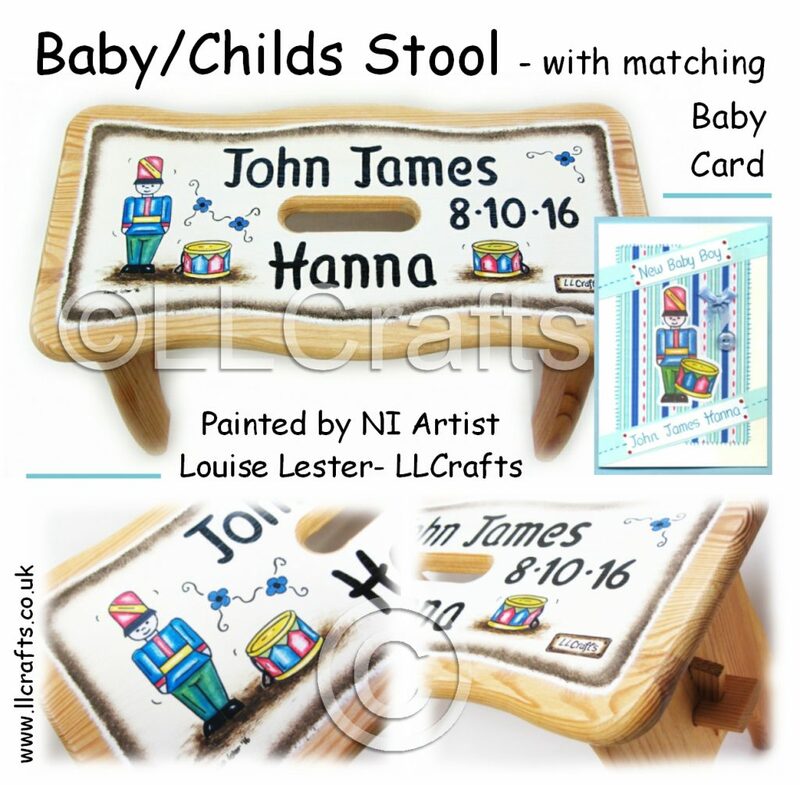 Also perfect for a christening or baptism gift …… or to simply celebrate your child’s birth or birthday! 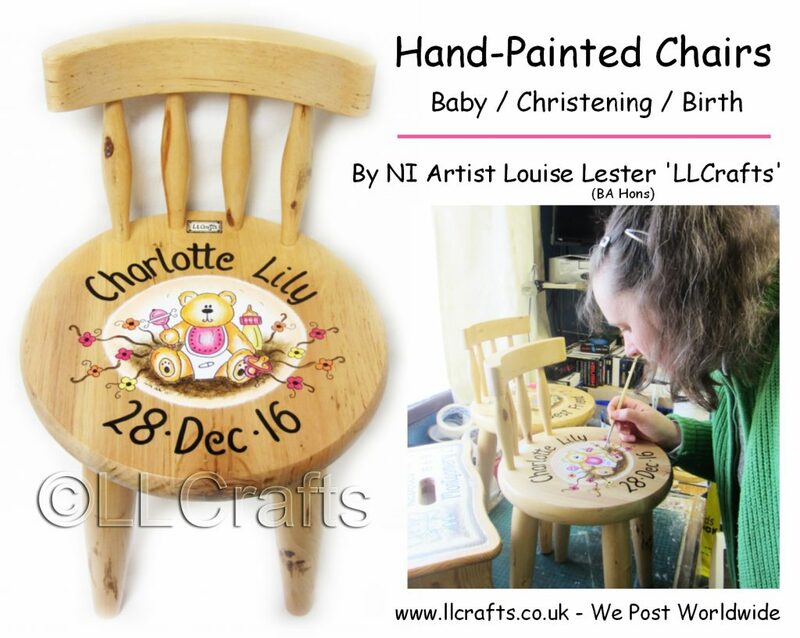 Contact us to place your ‘Baby Order’ ……. order NOW for Christmas! Why not join my CHRISTMAS CLUB …… to pay off your order in payment instalment’s.